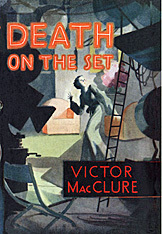 » Reviewed by William F. Deeck: VICTOR MacCLURE – Death on the Set. Reviewed by William F. Deeck: VICTOR MacCLURE – Death on the Set. VICTOR MacCLURE – Death on the Set. J. B. Lippincott, hardcover, 1935. First published in the UK by Harrap, hardcover, 1934. Film: Twickenham, UK, 1935, released in the US as Murder on the Set. Following the final takes of More Than Coronets at the Titan Productions studio in England, Cayley Morden, the producer — or what I would consider the director — is found shot to death in his office. Not only was Morden a well-hated man, despite his immense talent, but he apparently was leading a double life. A number of the actors on the set had obvious or not so obvious motives for doing away with Morden, and their alibis aren’t very persuasive. Investigating the crime is MacClure’s series character, Chief-Inspector Detective — well, that’s what the author says his title is — Archibald Burford, who has intelligence, money and a talented scalp. A good investigation that’s up there, I would say, with the cases of plain of Inspector French. Bibliographic Note: Murder on the Set was the fifth of seven appearances in England for Inspector Archie Burford between 1930 and 1937. Three of them, including this one, were later published in the US. I read at least one Burford. Not bad of it’s type. One I own but which I have not read is The Clue of the Dead Goldfish, Lippincott, 1934. I think I bought it because of the title. I may even know where this one is.